Matthew Boleyn — Reynolds and Kenline, L.L.P. Matthew was born and raised in Dubuque, Iowa. He graduated from Clarke University in 2008 and the University of St. Thomas School of Law in Minneapolis, MN, in 2012. 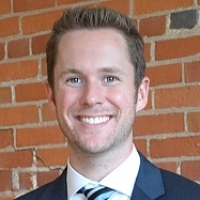 During law school, Matthew was an associate editor for the School’s Journal of Law and Public Policy, a certified student attorney with the School’s Consumer Bankruptcy Clinic, a Research Assistant for the Schoenecker Law Library, an intern with the Dubuque County Attorney’s Office, and a law clerk with Lawson Software, Inc., in St. Paul, MN. In 2012, Matthew joined Reynolds & Kenline, L.L.P., becoming a Partner of the firm in 2015. EDUCATION: J.D., University of St. Thomas School of Law, 2012; B.A., Clarke University, 2008. BAR MEMBERSHIP: Iowa, admitted 2012, Illinois, admitted 2016. PRACTICE AREAS: General Practice including, but not limited to Mediation, Criminal Law, Copyright & Publishing, Wills and Trusts, Family & Juvenile Law, Business Planning, Probate, and Collaborative Divorce, Real Estate.